Washington, DC - Since November 5, 2014 Paradigm Research Group has been conducting a Congressional Hearing Initiative seeking hearings for military/agency/political witnesses of rank and station to testify under oath to events and evidence confirming an extraterrestrial presence engaging the human race. 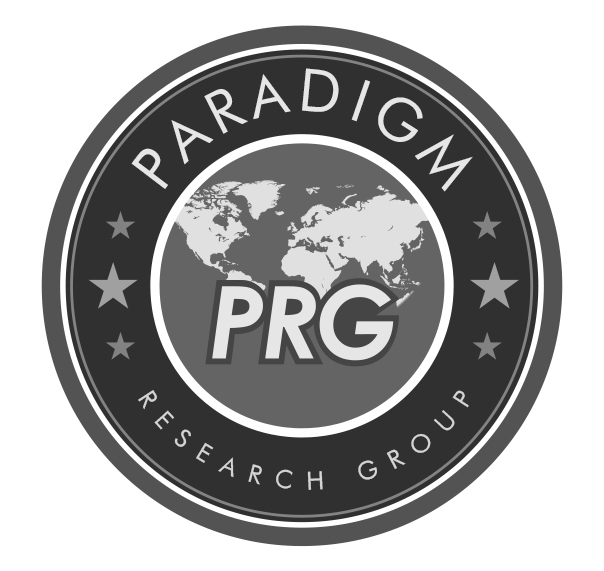 Simultaneous with the Initiative PRG has been working to see the extraterrestrial presence issue inserted into the 2016 presidential campaign. 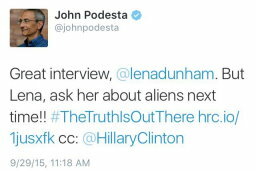 On September 29, 2015 the chairman of Secretary Hillary Clinton's campaign, John Podesta, posted the attached tweet regarding actress Lena Dunham's interview with Sec. Clinton. 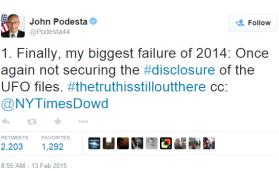 Over the past month Podesta has been copied on thousands of tweets to CNN requesting Sec. Clinton be asked about the Rockefeller Initiative during the debate. October 22, 2002 - In a press conference at the National Press Club for the Coalition for Freedom of Information John Podesta calls for the release of all UFO documents in government files because, "the American people quite frankly CAN handle the truth...and because it's the law." October 23, 2003 - In a press conference at the National Press Club for the Coalition for the Freedom of Information, John Podesta again makes the same request for the release of UFO related documents in government files. "The history surrounding this crash [Roswell] has never been adequately explained -- not by independent investigators, and not by the U.S. government [Air Force]........The American people can handle the truth -- no matter how bizarre or mundane. And after more than fifty-five years, every government document on the Roswell incident should be released to the public. With full disclosure and our best scientific investigation, we should be able to find out what happened on that fateful day in July 1947." September 14, 2005 - President Bill Clinton speaks to the extraterrestrial issue when interviewed in Hong Kong. 2010 - In a foreword to the book UFOs: Generals, Pilots, and Government Officials Go on the Record (2010) by Leslie Kean, Mr. Podesta writes, "The American people -- and people around the world -- want to know and they can handle the truth. UFOs: Generals, Pilots, and Government Officials Go on the Record represents a pivotal step in that direction, laying the groundwork for a new way forward." April 2, 2014 - President Clinton, in what was almost certainly a planned question, is asked about extraterrestrials by Jimmy Kimmel on his talk show. March 13, 2015 - President Obama, in what was almost certainly a planned question, is asked virtually the same question asked of President Bill Clinton by Jimmy Kimmel on his talk show. before the full retinue of the political press fully and appropriately engage persons seeking the presidency of the United States on easily the most important issue in the world today?